I’m going to share a little secret with you…. I don’t do much planning during my school year. I try to have most of my planning done over the summer. Now, if you want more information about how I plan over the summer you can read these two planning posts found here and here. However, even though I’ve chosen curriculum for the year that is fairly open-and-go, I still need to do a tiny bit of planning throughout the year. I get all of my planning done in a couple of hours on Sunday nights. On those evenings my husband takes all of the children to AWANA at church. I stay home, turn on some music, and get busy. So, I’m going to share with you how I do all of my homeschool planning (and my other weekly planning) in only a few hours one night a week. First I make a menu plan for the week based on what freezer meals I have already prepped. I go ahead and put together a simple breakfast for Monday morning such as muffins or baked oatmeal, so that I don’t have to make anything that morning. I then go down to the basement and pick up our school area. I function best when our school space is not a disaster area on Monday morning. I look back over the previous week and check off our school days on my calendar. My new state requires me to track the number of days that we school. I have a simple calendar and put a star on each school day. At the end of each month I tally up the number of school days that we have completed so far in the year. Easy! I grade any papers that need my attention (which usually isn’t too many since I try to correct papers as I go). Then I glance through the various curriculum guides and skim over the upcoming lessons to make sure I have all the needed supplies and know what we are going to cover for the week. I put sticky tabs on the lessons we need to cover – yellow where we will start on Monday and red tabs for where we should end by Friday. I go through all the books we are reading and update our reading basket, trading out old books for new ones. And once I feel ready for the new week, I enjoy some blogging time in which I can sort out my thoughts. My planning time is very simple and doesn’t require much time since I spent the summer going through all of our curriculum and preparing for the year. By doing most of my main planning over the summer, I automate my school year, so that our days and weeks run smoothly and I don’t have to spend much time doing prep work or much planning. But my one planning evening helps me feel organized and ready for each upcoming week. As the kids get older and are doing more independent work, I know I’ll need to spend more time reading ahead in the teacher guides or grading papers. However, for now, I get to have a quiet evening with some blogging time. 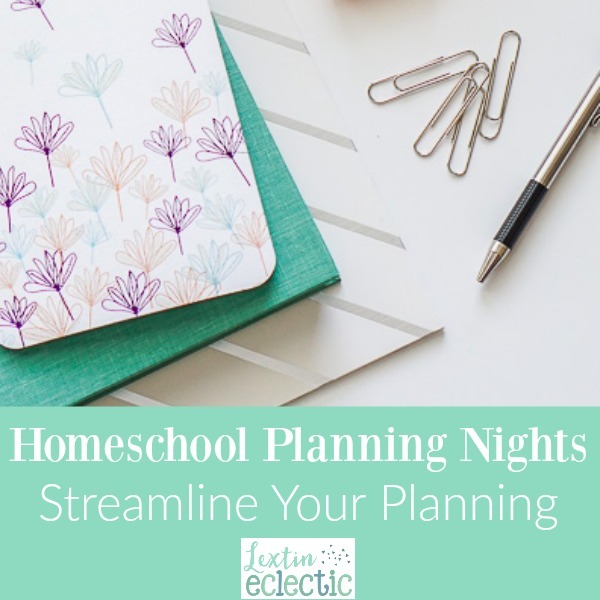 Having the one evening a week that is dedicated to homeschool planning is a huge sanity-saver for me. It is an absolute must in order for our homeschool to function smoothly. I do something very similar although I usually fit it in on Saturday morning. But you’re right – it makes a huge difference to be able to get your plan in place for the coming week.